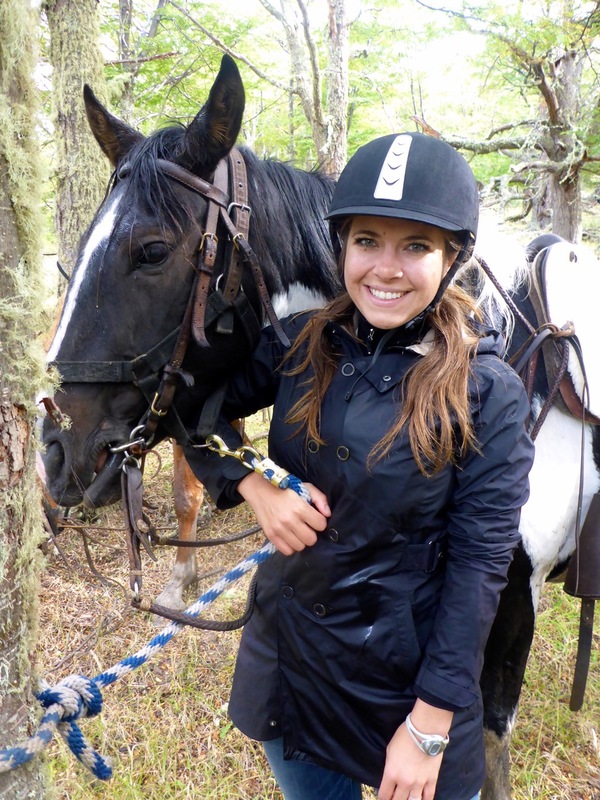 I’ve determined that there is a serious need for a review website for experience horseback riders looking for good places to ride – it is so hard to find! 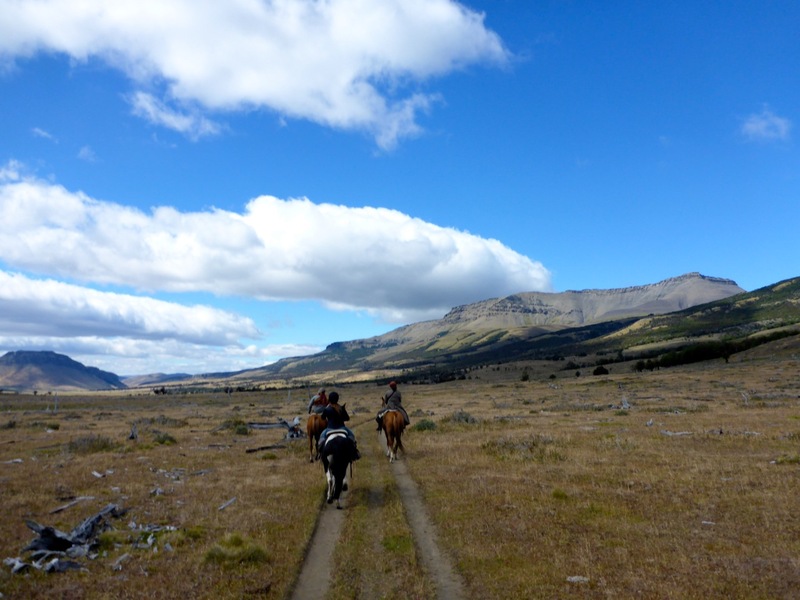 But fortunately we found a great place for riding in Patagonia. 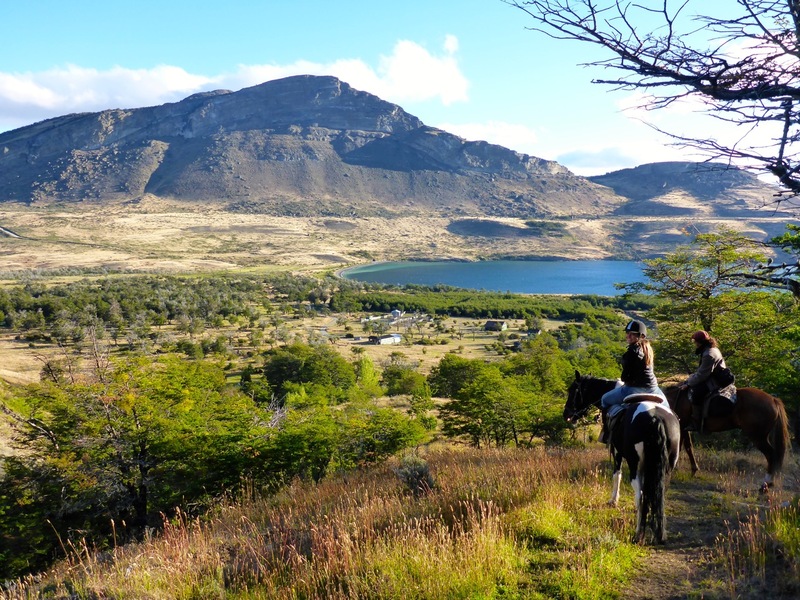 We just got back from a two day riding trip at Pingo Salvaje Estancia and it was amazing. We arrived at the estancia (that’s a ranch) to meet our guide, Cristian, who we quickly recognized from Base Camp just two nights prior. We met him through Kit, another friend from the hostel, and they play in a band together. Cristian has a great voice and plays guitar so well, beautiful original music. 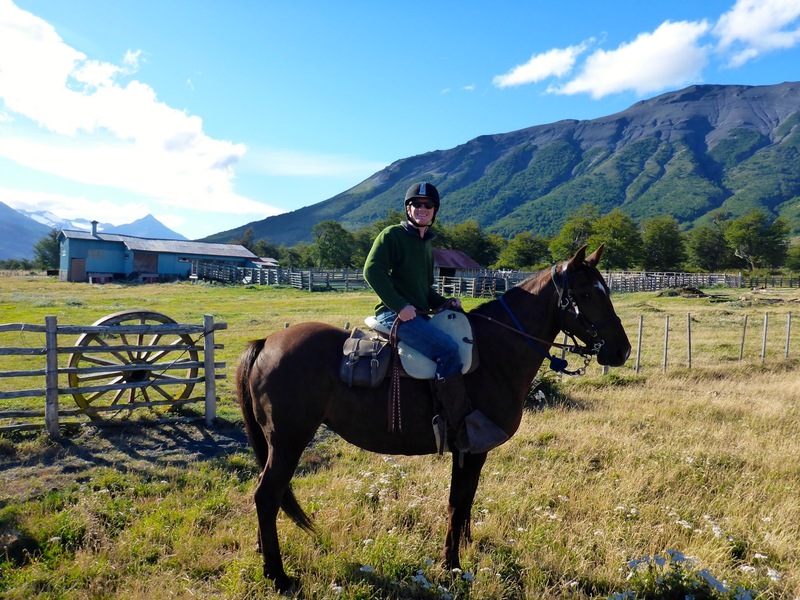 We told the estancia when we booked that we are experienced riders and only wanted to go if it was more than a “nose to tail” ride. They said they could do that…. 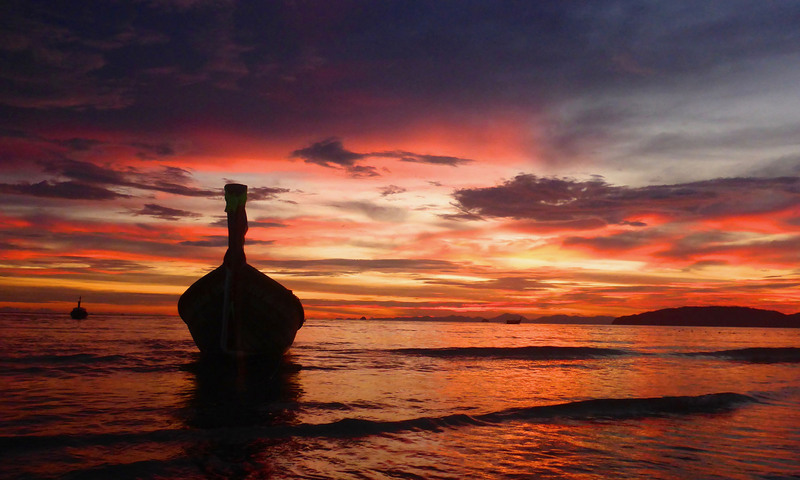 But when we arrived we realized we were with a group of inexperienced and first time riders. I was really concerned that this ride was going to be a disaster! Pablo, the head guide, told us that we would be “evaluated” the first day of our ride to see how skilled we were… which is fairly standard practice. But I was ready to get to the real riding. And Rick got to ride her mom, Pinta. She was very responsive and Rick really like her. He says she may be his favorite horse he’s ever ridden. We started off toward the mountains and rode through some beautiful valleys, passes and up towards the condor lookout and cliffs. 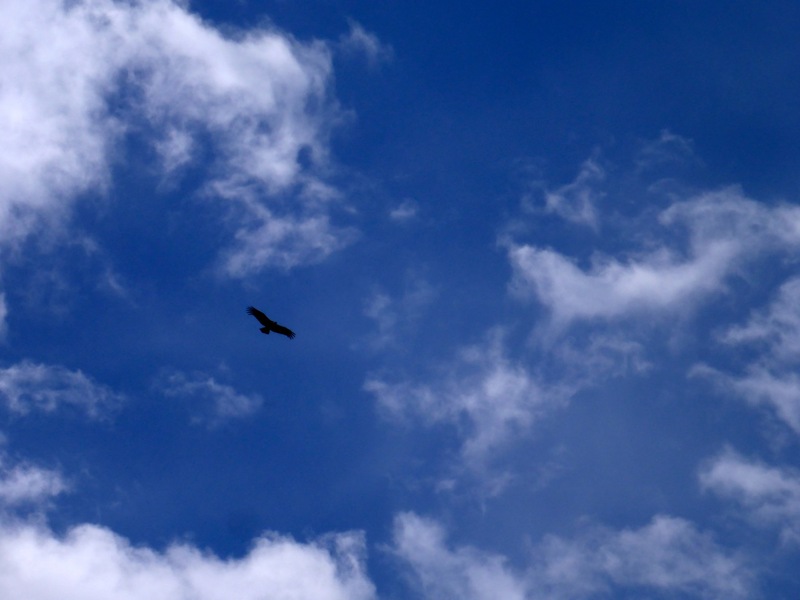 We were fortunate to see over a dozen condors – the largest flying bird in the world, with a wingspan of over 10 feet. We got a beautiful view of Laguna Sofia, where we had ridden through the laguna earlier. Then we got to do a little riding lesson for the newbies. Rick says I got my guide on. I just couldn’t help myself, and they actually did really well. We taught them in a circular clearing to canter. Then after, Cristian told Rick and I we could go ahead of the group so we got to have a little race across some of the flat area, of course, Rick “Saco-de-papas” Agostin won – he’s got the speed, I’ve got the style. 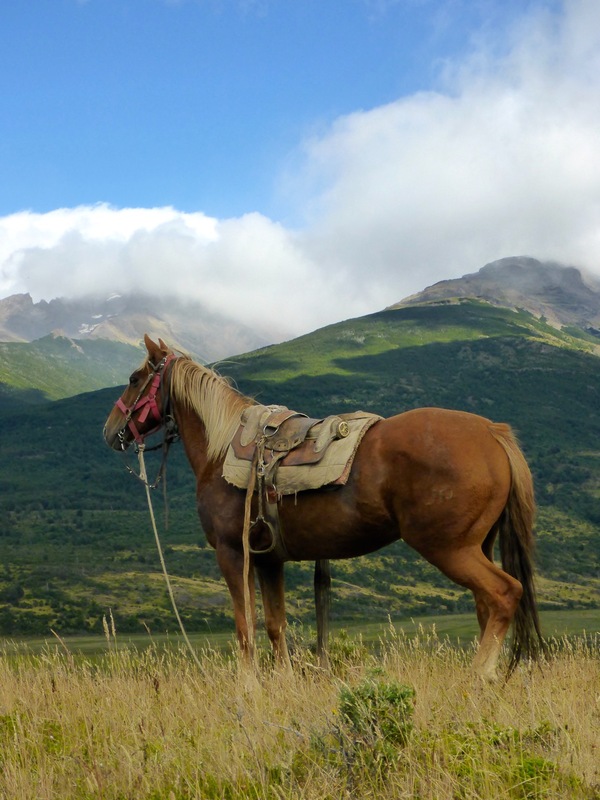 We got to ride for about 6 hours total, and returned to the estancia to set up our camp. 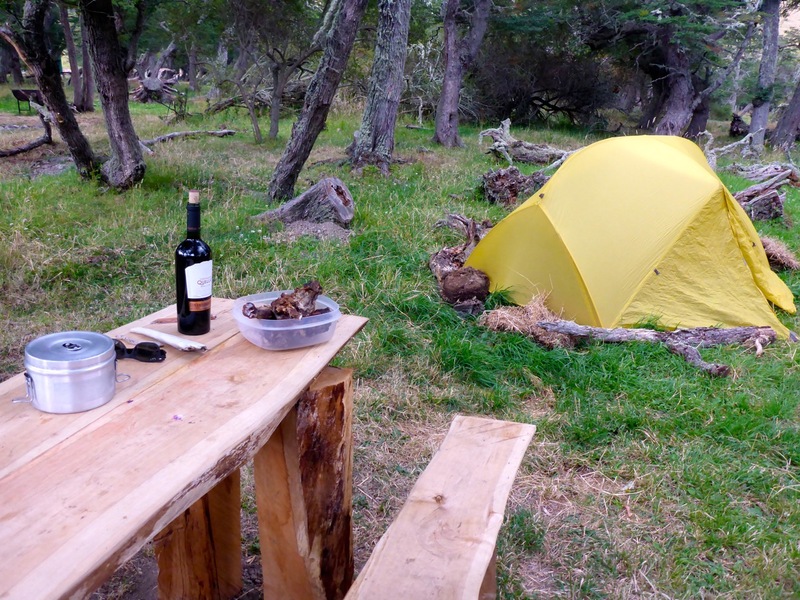 We thought we were going to be eating pasta and lentils for dinner, but we hung out chatting with Pablo and the team for a while and were offered a bottle of Carmenere and some left over Cordero Asado, fire roasted lamb.Upgrade! So we heated it over our bbq pit at the campsite and drank wine from the bottle, it was delicious. We went to bed early, excited for our big day the next day – we had proven ourselves as good riders and Cristian said he had some big ideas for us tomorrow! 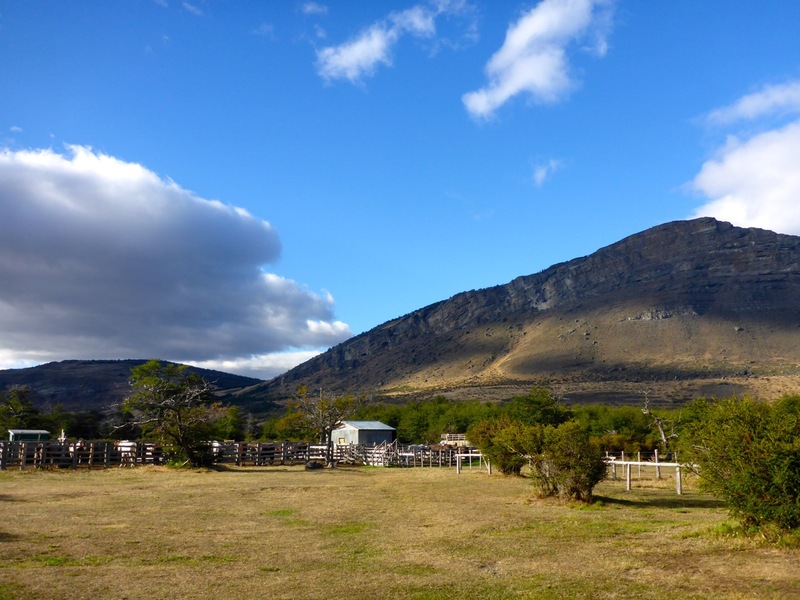 We woke up to almost completely clear blue skies, a rarity in Patagonia, it was the best weather day of our trip. Upon arriving at the barn, Cristian told us we were going on an exploratory ride today, a route that he hadn’t been to before. Claudio, one of the gauchos would go with us to show us the way, it would be a long ride. So long in fact that Rick had to switch to a younger horse that could make the ride, so he got Estampa for the day. I got to stick with Crazy Maria. Immediately we took off at a strong canter. It was like a dream, completely unreal, we were galloping along the ridge with incredible vistas of the lakes and mountains. We crossed through a couple of other estancias and arrived at a bluff that overlook a panorama with both mountain ranges and multiple lakes. 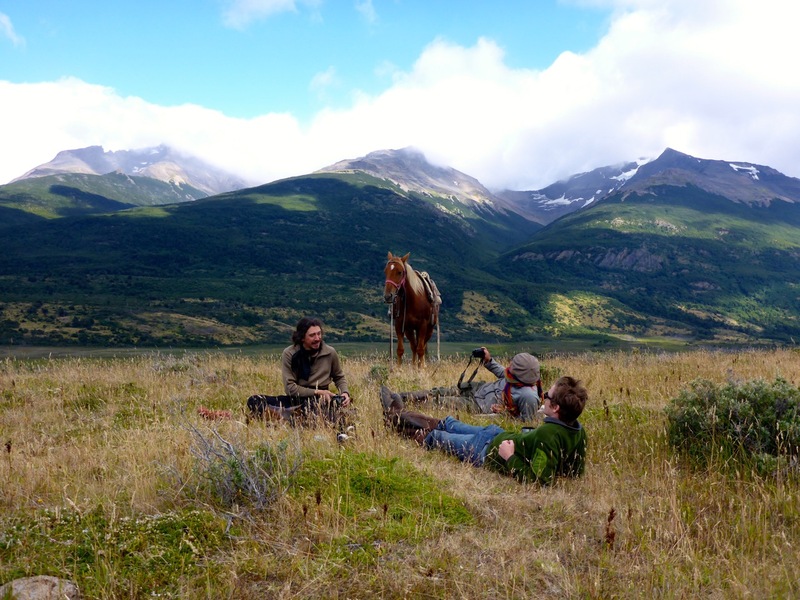 We stopped to rest the horses and have some yerba mate. We all sat around and just chatted and sipped our mate, the moment could have been out of a movie I can’t picture anything more perfect. We continued on through an ancient Lenga Tree forest. We had to go around the mountain to get to the entrance to the valley we were going to. 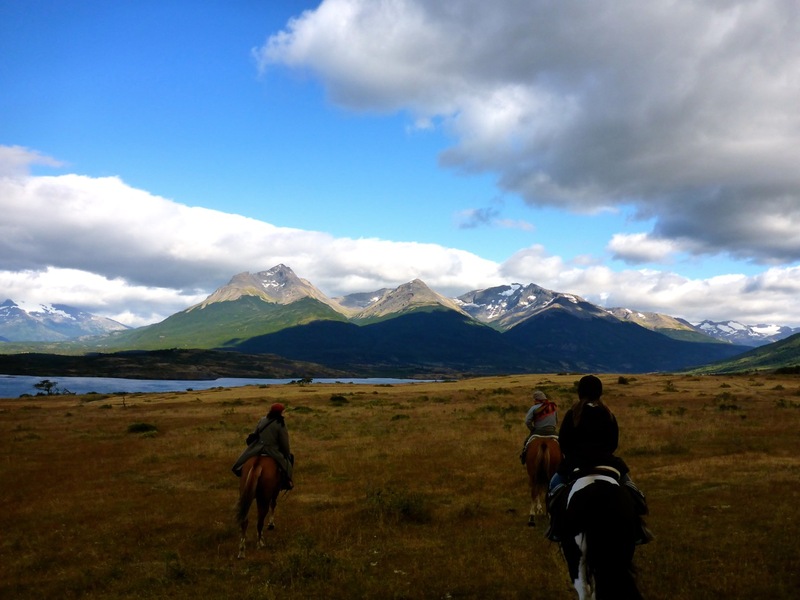 We started up toward the valley and got incredible views of the entire Torres del Paine park. We could see the southern most torre, the Valle de Frances and John Gardner Pass. We continued into the valley and that’s when things got a bit scary. We were cantering through the valley and I looked back to see Rick, and when I turned around all I saw was Cristian’s horse upside down, legs flailing in the air… she just hung there, somehow perfectly balanced stuck on her back… then I realized Cristian was UNDER her!! All I could see was a leg sticking out from under the horse’s side. I had no idea what to do, I just started to ride towards them. Pluma, Cristian’s horse, stayed balanced on top of him for what felt like 5 minutes, but was probably 45-60 seconds. She finally got on her side and was struggling to get up, I watched in slow motion and the hooves landed on either side of Cristian’s head, one hoof kicked him in the stomach, another in the knee. Pluma ran off spooked, but Cristian laid on the ground not moving. I honestly thought he was dead or unconscious. People just don’t get up from that kind of thing. When I got to him, he was moving… a little. Quite shaken with some bruised ribs and a messed up leg, he was actually able to stand up. It was a miracle. I went to retrieve Pluma, who was also shaken up, but let Maria and I get close enough to grab her. By some miracle Cristian was able to get up and walk around, and insisted he was good enough to continue riding. We continued on through the valley headed for the puesta (a rustic, very isolated cowboy camp) where we would have lunch, and celebrate Cristian’s amazing survival skills! It was a good time for a break, we let the horses graze and we feasted on chorizo, homemade bread, queso fresco and yerba mate. 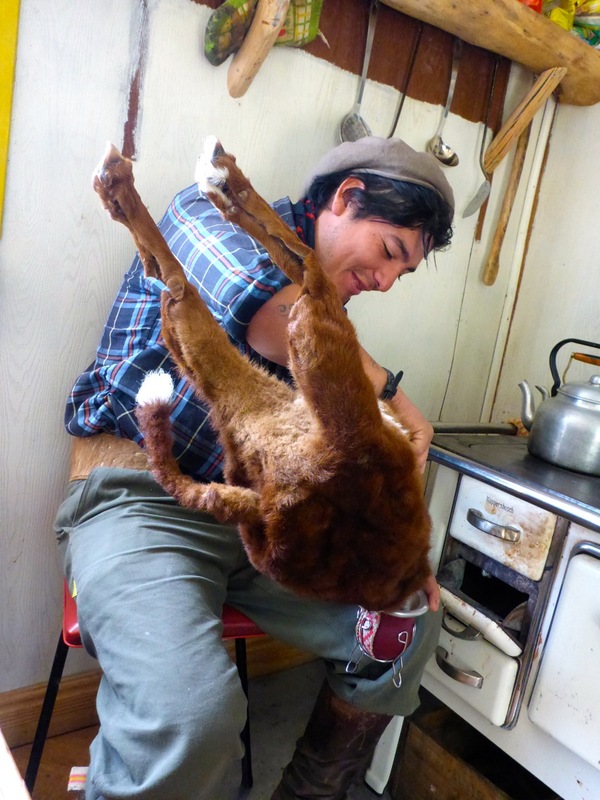 This was special mate through… it came from a calf container! The views continued all of the way back. The afternoon light made the lakes and mountains a completely different color. We got to gallop back across the beautiful landscape. 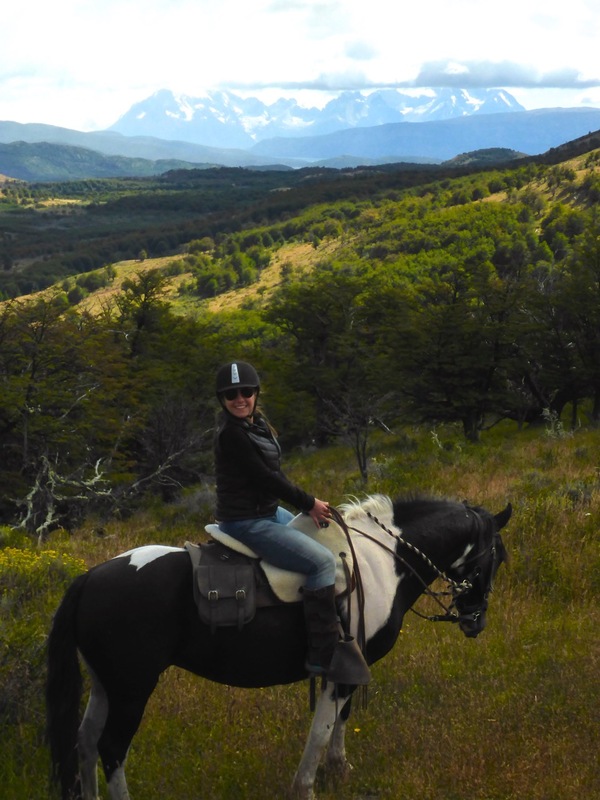 We arrived back at the estancia and realized that we had been riding for 10 hours! 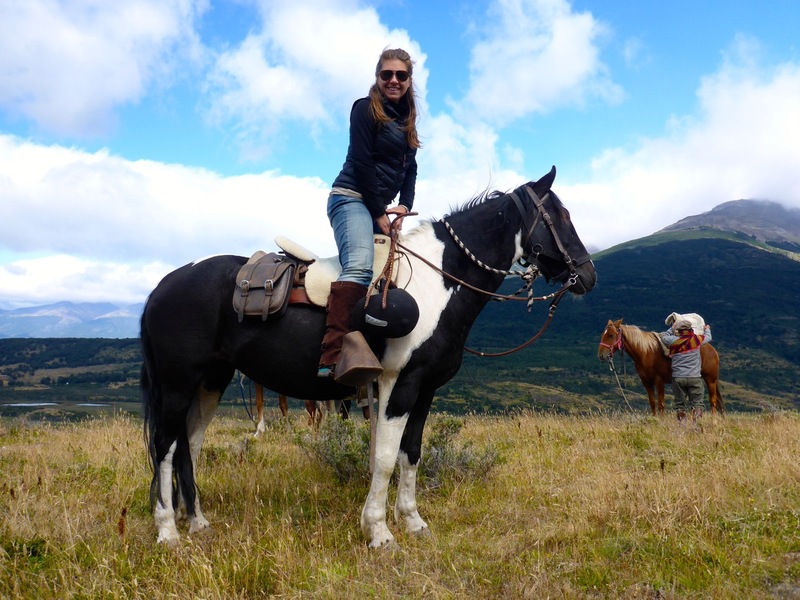 It had been amazing, some of the best horseback riding we had done. Thank you Pingo Salavage and Cristian! You are the best!! Which one is Christian? I looked at the website gallery, really cool. Maybe you could help with the outdoor gourmet dinning too, Liz ! Liz you are so beautiful!! Awww thanks! You’re so sweet. Miss you. Previous PostPrevious Torres del Paine: John Gardner Pass Summit Day!